Low end. Rhythm. Groove. Melody. "I think if I was going to sum up in one word John’s contribution to the band it would be ‘Hungware’. His bass line to this song is bouncy yet sophisticated a great carrier for the rest of the music to gel to. John is also the self professed “miserable git” of the band, but leaving his sledge hammer bedside manner aside, he can often be seen grooving and gyrating to the music, often entreating us to do the same under the auspices of ‘stage presence’. Smelling a rat however, I think this ruse of musical professionalism is just a trick to get us all involved in a carefully orchestrated hippy love in!" "Like another great bass player before him, John is incredibly tall. This likeness to Krist Novoselic certainly worked in his favour when he auditioned for the band, but luckily the resemblance wasn't only physical, as it was soon clear that John also possessed the Nirvana man's penchant for memorable riffs. The dream came truer still when John also seemed entirely open to the concept of using effects like my other most-adored bassists - Simon Gallup of The Cure (chorus! ), and Muse's Chris Wolstenholme (distortion!) to create tones that would truly complement - nay, help define - the sound of The Vaulted Skies. Yet despite being a particularly appealing Frankenstein's monster of all my favourite four-string fellows, John's compositions are also highly original, weaving between light and shade in ways that never cease to impress." Definitely his own man, and self confessed part-time miserable git, John's pithy interjections often provide the launch pad into new possibilities for the band. Prowling the stage, John's live presence, humour and obvious pleasure gives the band a special dimension and I'm proud to share the stage with him." "The hard-man of TVS, John is a man of few words…and most of them grumpy. Having met around five years ago, playing in a previous failed musical(ish) venture, John is accredited with introducing me to TVS. As wingman in the rhythm and bass section, we have developed a strong rapport whereby he never hesitates to criticise my (few) mistakes and I never hesitate to ignore him. 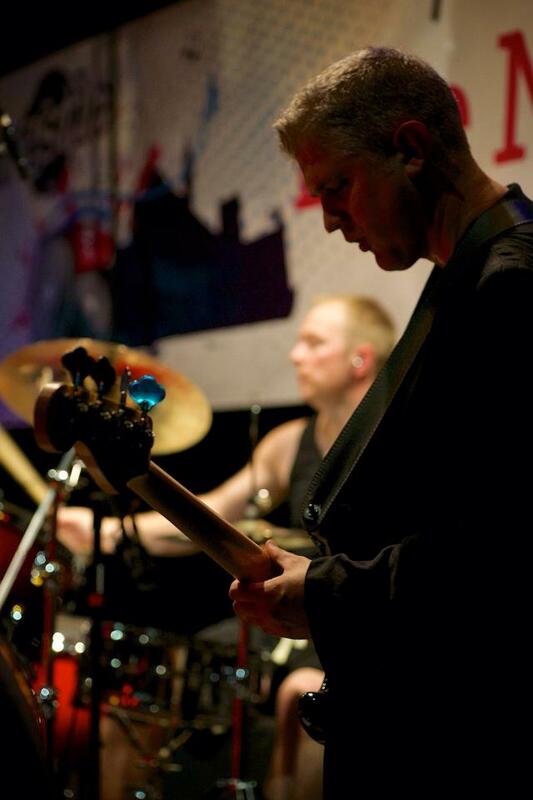 Currently a member of at least five other bands, John spends more of his time on stage than anywhere else. With infallible timing, he has often been known to challenge my time-keeping (and even the drum machine) – and win. John is a fantastic musician and all round nice chap, he’s cool as a cucumber on stage and delivers outstanding performances gig in, gig out." Jazz bass, to be precise.